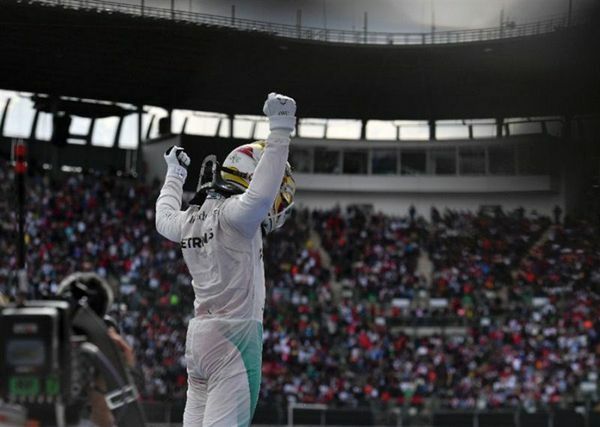 Lewis Hamilton accepts that his victory in Sunday's Mexico Grand Prix may have come too late for him to keep his champion's crown. In the aftermath of a tumultuous race at the Autodromo Hermanos Rodriguez in Mexico City, the defending three-time champion acknowledged that his resurgence might not be enough to stop his Mercedes teammate Nico Rosberg cruising to a maiden drivers' title. "It's a shame that these results are coming so late in the season for me," said Hamilton, after a near-flawless drive to victory ahead of Rosberg. "You can look back and say that maybe if Malaysia didn't happen then I'd be in a different position right now..."
Hamilton was left pointless in Malaysia on October 2 when a near-certain victory was taken from him by an engine failure. If he had won the race, he would be leading the championship. "I am fighting now for something that I don't know if I will be able to make. It is an unusual scenario to be in, but I have got to push all the way to the end. "One way, it can be painful — and one way, it can be a great thing. "But all I know, from the beginning of my career in Formula One, is that right until the last minute it can change. So that is why I can't give up." Rosberg, who has a 19-point lead with two races left, knows he will be champion if he can win in Brazil on November 13. Hamilton, who drew level with four-time champion Alain Prost of France in the record books with his 51st win, has never won at Interlagos. The Briton knows this and knows, too, that even if he can win there and also in Abu Dhabi on November 27, it may not be enough if German Rosberg finishes second and third in those races. "It is cool for me to be in this situation, but I am not going to change my approach," said Rosberg, who struggled to find his best form in Mexico. "There are still two races to go and anything can happen in this sport. I am comfortable working my own way, one race at a time, so I am staying that way as it feels the best." Long after the post-race farce in Mexico, where Max Verstappen finished third on the track for Red Bull, only for Sebastian Vettel to stand on the podium for Ferrari before Daniel Ricciardo was classified third in the final result, due to penalties, the stewards explained why Hamilton was not punished for running off and rejoining at the first corner. Telemetry taken from his Mercedes showed that Hamilton had backed off significantly after the incident and gained no "lasting advantage" according to the stewards.